Mum in her ground floor room with garden access. For about the last twelve months our family has been seriously discussing at what point my parents should give up the family home and move into the local Aged Care Facility. Even before that it was on the agenda and the last time I was in Australia I visited the complex with my sister and her husband and we met with the general manager, the director of nursing and several other people there. I was already somewhat familiar with the place as I had visited people there on occasion when I still lived in Australia. Being visited by the dog, Bunjee. My mother has dementia. In general I can have a fairly normal conversation with her on the phone, but her attention span is not that great and she can no longer follow a rapid or complicated discussion. She's fine on the weather and what she's been doing recently (although she sometimes mixes days and events up) but she doesn't follow current affairs any more. She gets muddled and stressed if her routine is upset too much. Her eyesight is also failing, and the combination of that and her dementia means that she gets disorientated very easily outside the home, even in the supermarket and the main shopping street in the small town where she lives and has been going to for decades. She has glaucoma and wet macular degeneration, so she needs big print and good light. Nevertheless, she is a devotee of colouring in for grownups (currently very trendy) and loves the new gel pens one can get these days as they make very clear bright colours. as a newly qualified triple certificate nursing sister. In the last couple of years my mother's condition has meant that my father has had to learn to cook and grocery shop. Mum has got to the stage where she can't follow a recipe any more and forgets ingredients or steps even in dishes she knows well. She was also prone to forgetting she had taken something out of the freezer for dinner, and taking something else out. Nevertheless they were managing to stay in their own home with the help of a care package which included someone who cleaned and did the ironing, and a gardener. However, my father has Parkinsons and was finding that making sure Mum was alright and dealing with her memory loss and frustration with herself was increasingly hard on him. When Mum is frightened or frustrated she has a tendency to lash out at Dad, which he finds deeply upsetting. In many ways my sister and I were always more worried about him than Mum. Anyway, to cut a long story short, a place came up at the local Aged Care Facility and was offered to Mum. After consulting with my sister and me, my parents have decided that it was the best solution for them now. It's a huge change for them, but Dad visits every day (Mum is only a few blocks away from the family home) and their dog is welcome to visit too. They still go out as a couple to social events at least twice a week. Dad has hung lots of pictures from their home in her room and installed some of her own furniture, such as the desk made for her by her father's foreman when she was a teenager. He also has negotiated a new home care package for himself which includes more services, such as someone who brings firewood up to the house and will clean the gutters when necessary. My mother has known many of the residents and staff at the centre for a long time. She often can't remember their names, but she knows she's friends with them. The centre is well designed and the food is good. The residents are looked after by caring professionals. My father hung a photo of my mother as a young nurse in her room because he thought it was a nice likeness of her, and because he wanted to remind people that my mother was not always a little old lady. In fact, she was a nurse specialising in aged care and home nursing, just like the people who care for her now. I thought it was a particularly nice touch. Photos courtesy of my father. 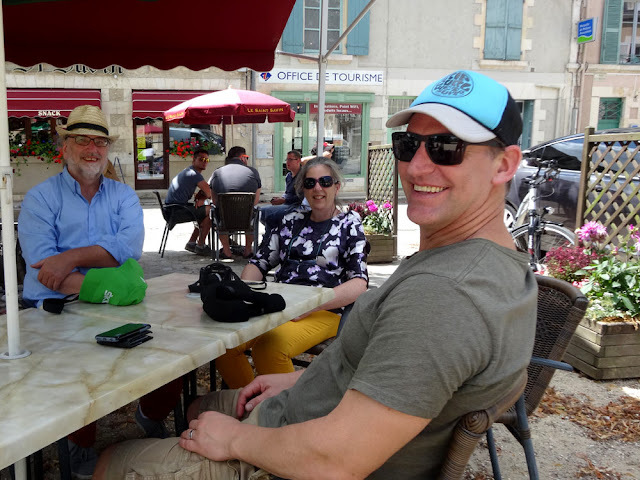 One day a few weeks ago I was waiting in the carpark on the Mail in Loches for Simon to arrive in Célestine with our clients for the day. 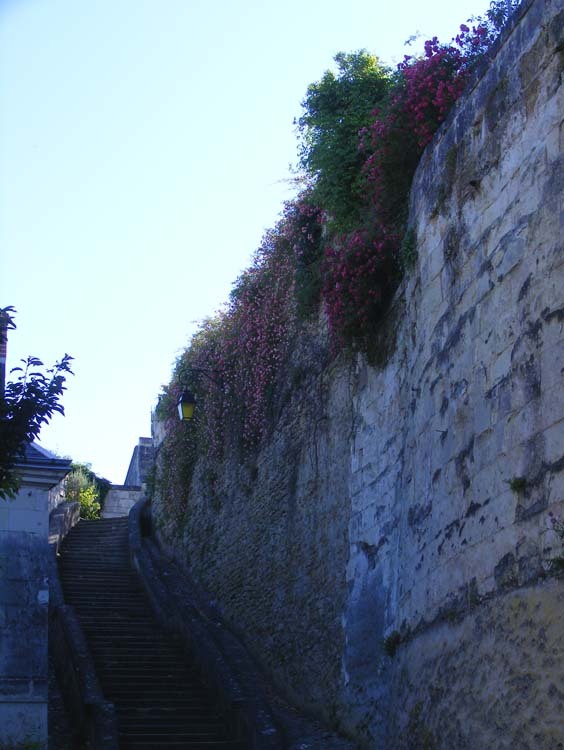 I was rather early and occupied myself by taking a few photos of the location, including several shots of some spectacular roses in full bloom and tumbling down the retaining wall of the Royal Citadel. 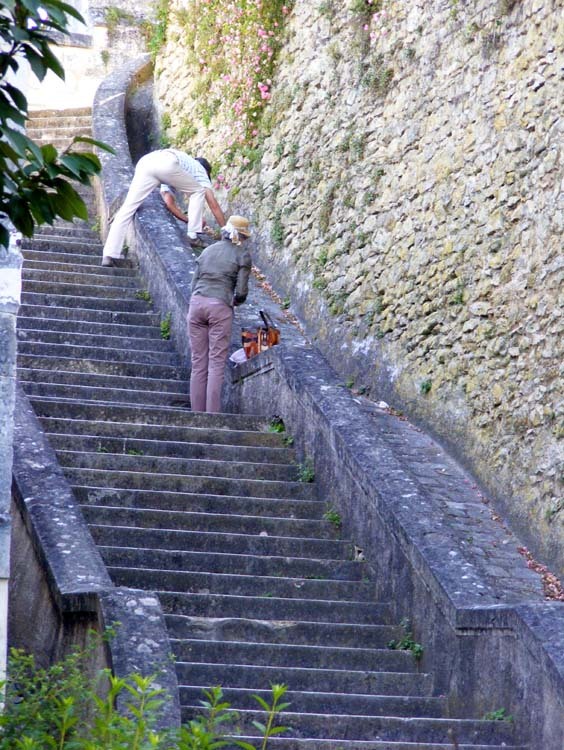 After about five or ten minutes of this a well dressed couple in late middle age appeared and started up the steps. Halfway up they stopped and peered over the balustrade. They could clearly see something they really wanted in the gap between the stairs and the retaining wall. I was far enough away that I couldn't quite hear what they were saying. I managed to catch him saying '...sac plastique...' and seconds later, after rummaging in her handbag, she pulled out a plastic bag. Then they started harvesting dried fallen roses. I took a surreptitious picture. I've been wanting to write about this machine for ages, but it is not easy to photograph. This photo is the best I've been able to manage. As you can see, it was taken from a moving vehicle (Célestine, in fact). The place is the big market garden in the Cher Valley at Saint Martin le Beau. 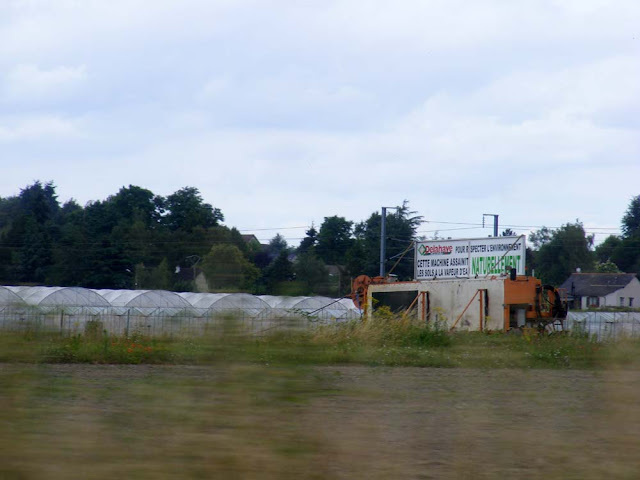 The sign on the machine says 'Delahaye [the name of the market gardeners]. In order to respect the environment this machine sanitises the soil with steam, naturally'. We often see it in action, trundling up and down the plots that will then have yet another crop of lettuce, lettuce, lettuce, Florence fennel, potatoes, celery, leeks or lettuce planted in them. The way it works is that dry superheated steam is injected into the soil under low pressure to a specified depth, depending on the crop to be planted. The soil temperature is raised to 80-85°C and 'cleaned' of weeds, fungi and other pests whilst preserving the qualities needed to raise healthy crops. The soil has to be prepared by being ploughed to a fine tilth before the steamer goes over it, to make sure penetration is sufficient and consistent. The 'steam clean' allows a non-selective disinfection of the soil and a rapid rotation of crops. It is versatile because there is apparently no development of resistance to the treatment. It's simple to use and doesn't involve special training to deal with pesticides. The manufacturers of the machine claim that it gives better crops both in quantity and quality and allows earlier crops due to the heat being retained in the soil. The technique does not involve any danger to the user, plants or soil. The treatment kills weeds, fungi, nematodes, soil dwelling insect larvae, bacteria and viruses. This all sounds excellent, but nowhere can I find any research into what good bacteria and fungi the steam also kills. I also wonder if some organisms will eventually develop a tolerance to the heat. Nevertheless, it is probably on balance better than using the cocktail of pesticides that much of our fruit and vegetables are exposed to. Further Reading: CM Regero Industries (in French). The main staircase has been revealed and now it's the turn of the right hand wing to be covered up and minutely inspected and restored by the conservators. 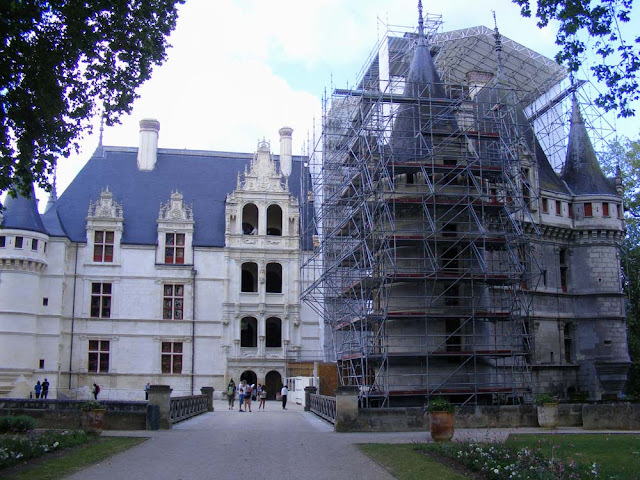 This year the Centre de Monuments Nationaux has been calling for donations to help restore the highly decorative metal finials (Fr. épis de faîtage) on the pepperpot roofs and gable ends of the chateau. The campaign is called 'Ma pierre à l'édifice' (literally, 'my stone to the building'), a phrase that means 'a contribution'. The finials are a rare survival and will cost €10 000 each to restore. 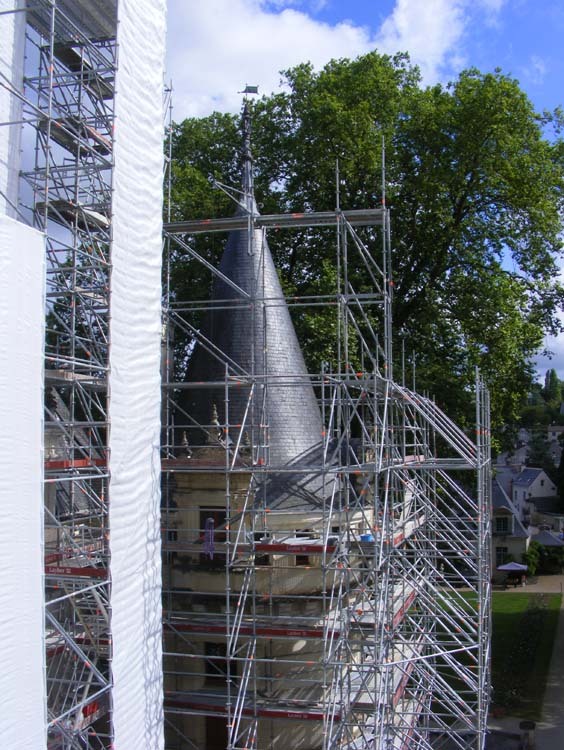 Half of the money has already been raised and it is planned to restore four of the finials. The finials are about six metres high and appear to have been made in the first half of the 19th century, but incorporating much older elements. They are suffering from rust and other corrosions, and need consolidation and repair. The first stage is to identify the different metals they are made of. 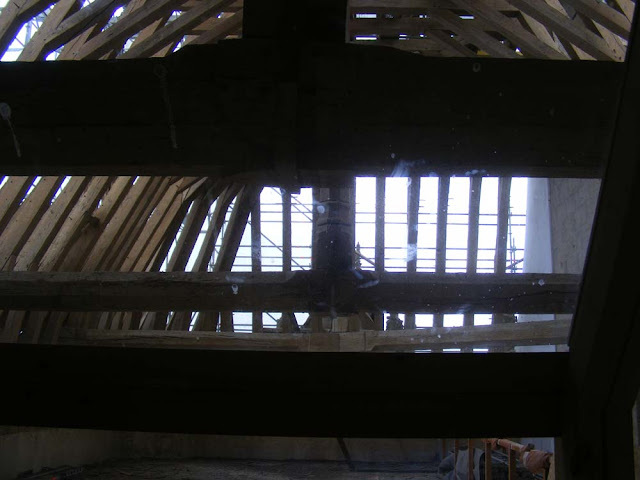 This will be done by the guild of master roofers, who have the knowhow to work with these metals and will also consolidate the fixations. Then they will be carefully cleaned and treated with a product to prevent the rust and corrosion returning. 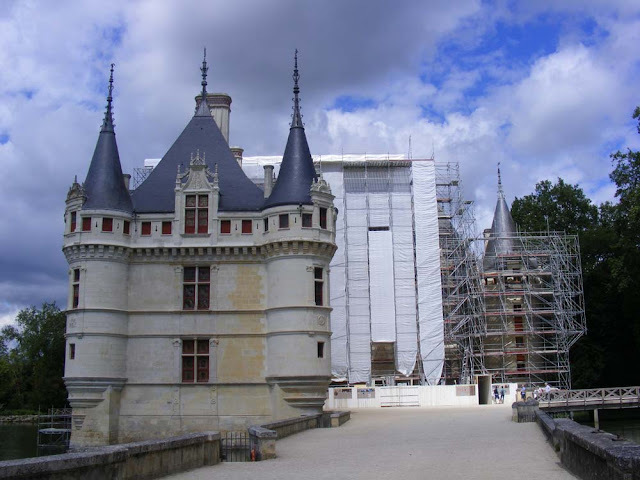 To read more about the Chateau of Azay-le-Rideau, click here for our other posts on the subject. Simon took this photo because he was amused that I appeared to be wearing an outfit carefully chosen to blend in with the surroundings. Azay-le-Rideau is an attractive village on the Indre River. For such a small town there are a lot of restaurants to choose from (at least fifteen in a town of 3100 residents). As far as we are concerned by far the best restaurant in town is Coté Cour, situated right by the gates of the chateau. 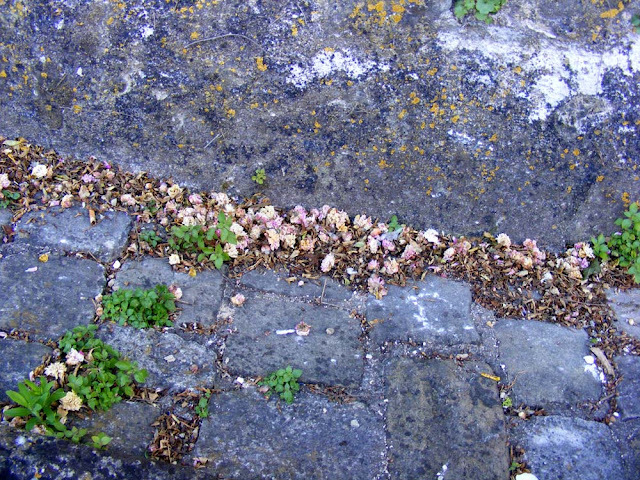 Pavé de merlu, céréales gourmandes et petits légumes. 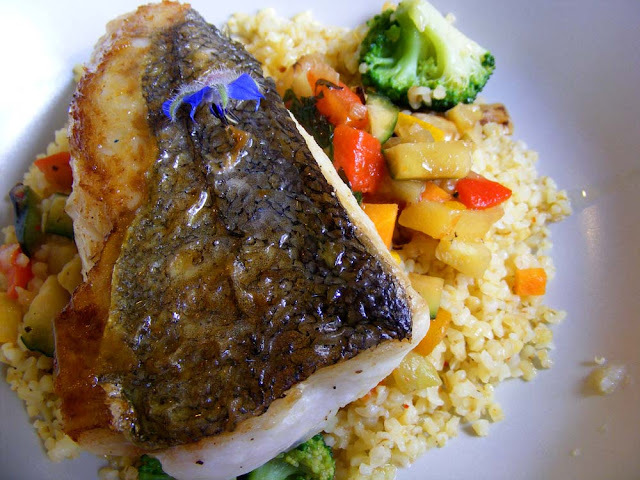 Hake, gourmet grains and diced vegetables. 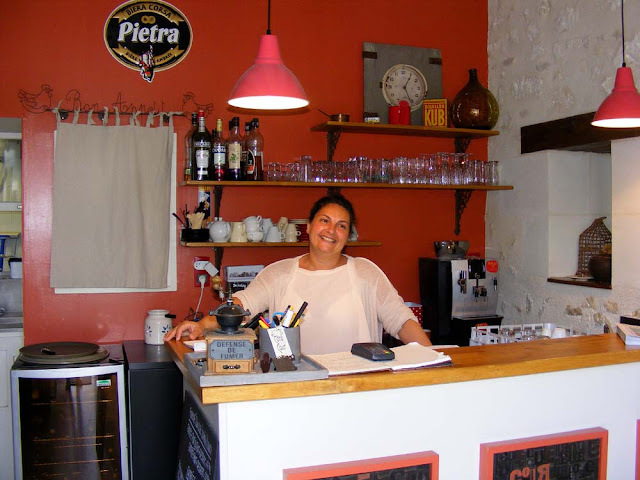 It is run by husband and wife team Fréd in the kitchen and Sandrine doing front of house. He's from Corsica, she's from Paris. They live above the restaurant. Both of them speak reasonable English. Duo de melon et tomates, tranche de jambon cru. 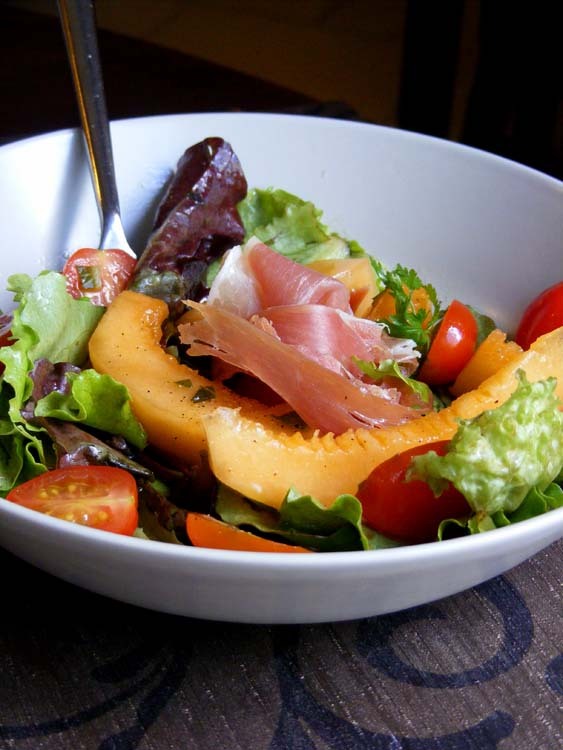 Duo of melon and tomatoes, slice of air-dried ham. The menu is limited and focused on fresh local produce. It's a mixture of year-round staples and dishes that come and go as the seasons wax and wane. It is one of the few restaurants in the area that we can happily take vegetarians. Fréd only needs to be asked and he will whip up something delicious and plant-based. He told me once that he thinks French chefs should take diners who prefer plant-based dishes much more seriously than they currently do, and I'm sure he enjoys the challenge of creating something new that makes the diner happy. 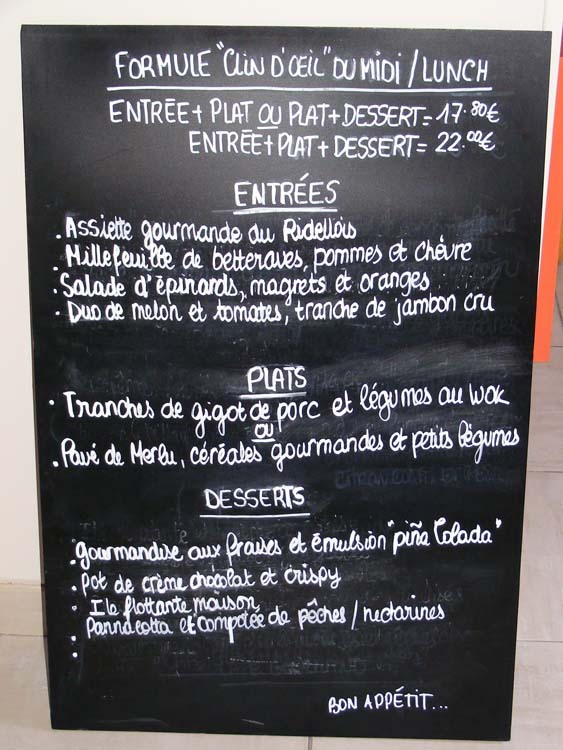 Tranches de gigot de porc et légumes au wok. 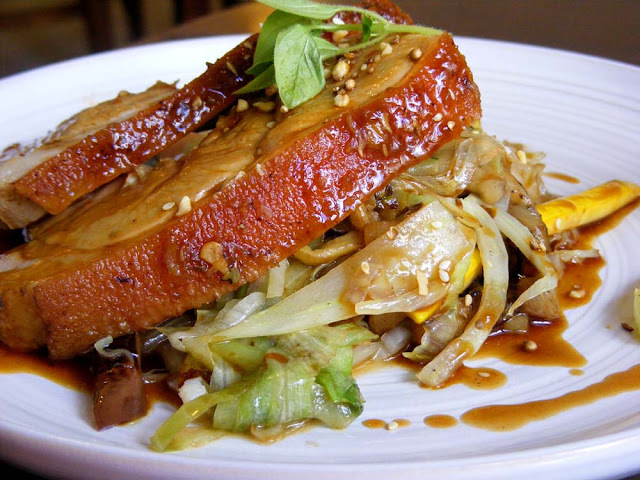 Slices of leg of pork and stir-fried vegetables. Salade d'épinards, magrets et oranges. 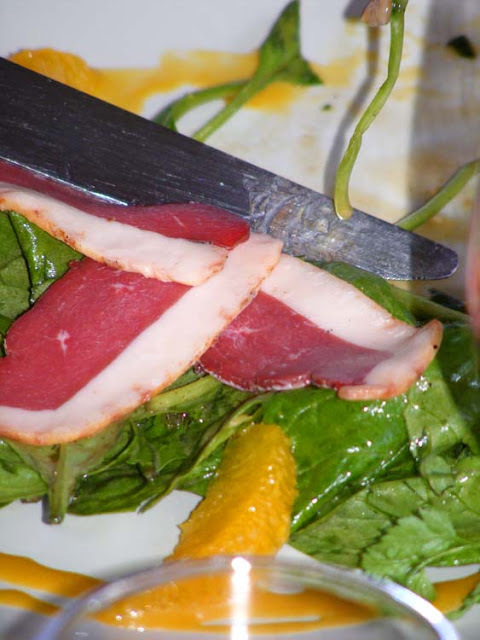 Spinach, fat duck breast and orange salad. Fréd in his surprisingly small kitchen. 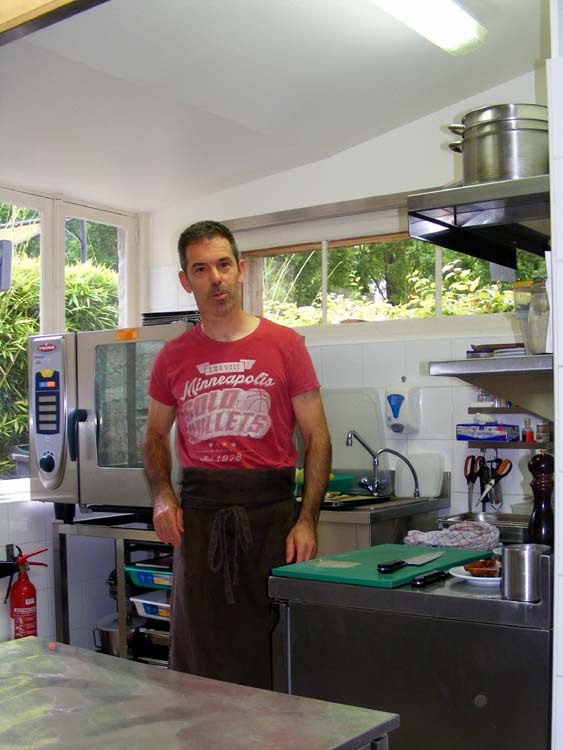 Unlike several French chefs I know, Fréd is always ready to be photographed in his kitchen and does not put me off with 'oh no, it's too messy in here at the moment...'. 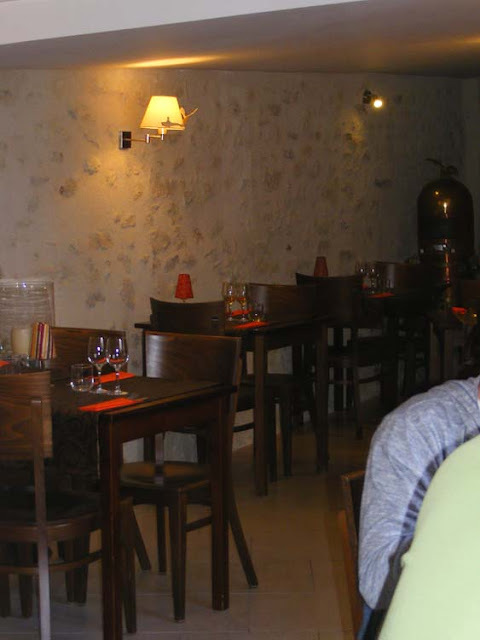 Sandrine designed the interior and a local artist created the decorations on the light fittings. Sandrine at the reception desk. I photographed this building in Milan last year because I am interested in sgraffito. At the time I had no idea that it was one of the oldest and best known pastry shops, confectioners and cafes in the city. Consequently we didn't go in, and I guess that's our loss. According to their website, the business was started in 1824, operating from this 18th century building. In the beginning they just made and sold cakes, biscuits, pastries and confectionaries, but in 1900 the family expanded their operation to include a bar which served coffee, refreshments and cocktails. They have always prided themselves on their traditional manufacture of classic lines using fresh ingredients. Even today the products sold are made on the site, and the offices are out the back, allowing scrupulous quality control. Today the business is run by the grandson of the original owner, his wife and their children. 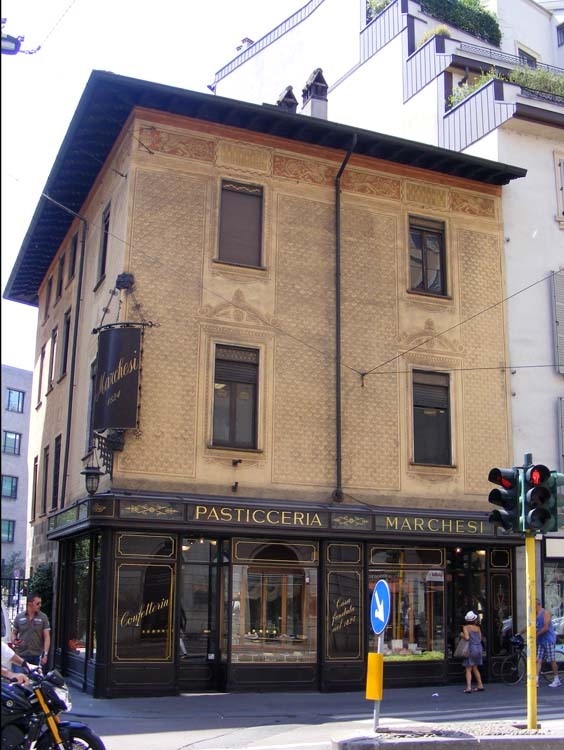 For the last twelve months we have written about the northern Italian city of Milan on Mondays. We think it is time to stop now, so this will be the last post regular post on the subject. To read our other posts on Milan click here. In 2009 I stayed with my family at Green Cape. This is an isolated penninsular on the New South Wales coast, with former lighthouse cottages that you can rent as self-catering accommodation. 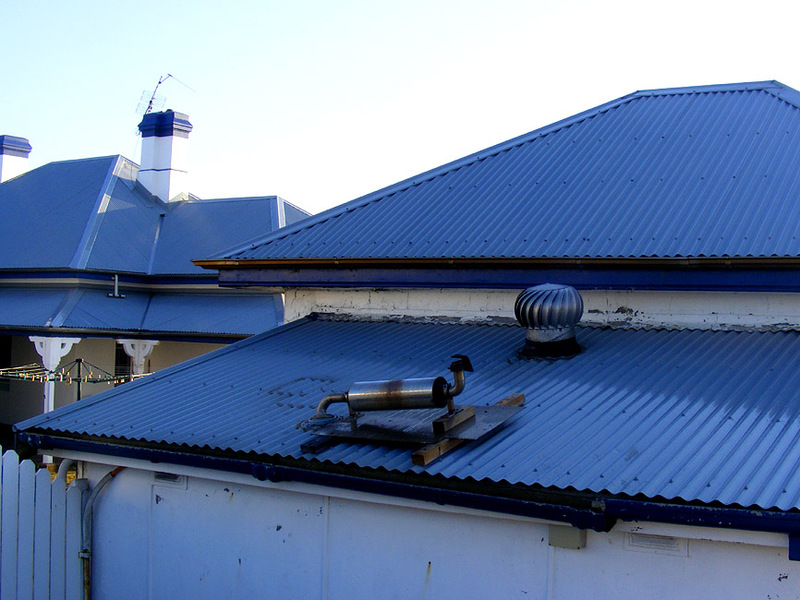 It's off-grid and this rather sculptural object on the roof of a lean-to turned out to be the custom made muffler for the large generator which provides electricity for the Green Cape Lighthouse complex. It was certainly effective, as we never noticed anything more than a gentle background hum. Our posts on Sunday have an Australian theme. If you would like to read more of them please click here. This photo was taken from the wallwalk of the Chateau of Chaumont-sur-Loire on one of our recent heatwave days. The river looked inviting, the swifts were in abundance and zooming around the sky, catching insects and practicing their manoeuvres for their all too soon journey back to Africa. Many of these birds will have left on Tuesday on their big migration south. They appear to have nested in the roofspace of the chateau just beyond the upper left of this photo. Carolyn tells me that the chateau was one of the first places in Europe to install swift nest boxes, way back in 1994. The photo has some blurry patches which are because it was taken through a window with some smudges on it. 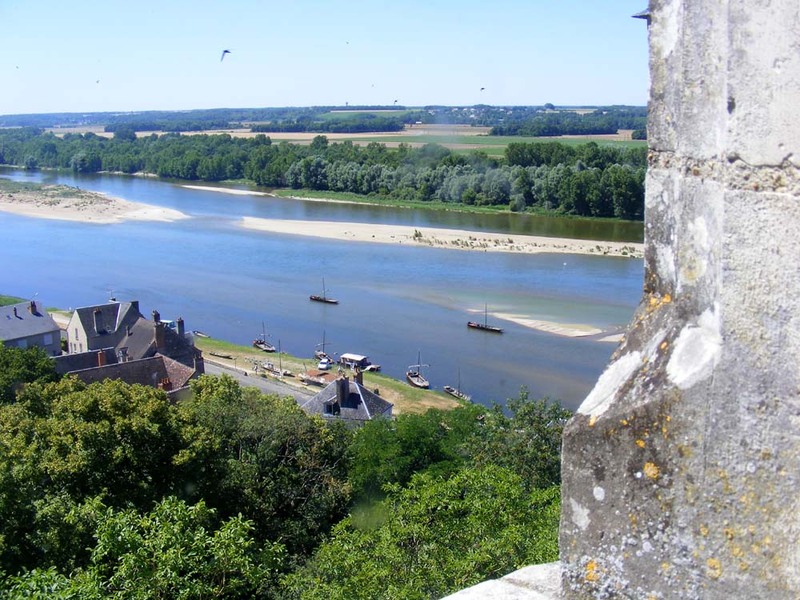 There is no doubt that the Chateau of Chaumont has some of the best views of the Loire, and makes a very pleasant visit on a hot day. The park is inviting and full of quirky sculpture. The garden festival always has something of interest and the new garden across the road is vast and has more great sculpture and plantings. Inside the chateau has been much improved in the last couple of years, with more information about what you are seeing and a well thought out blending of historic house presentation combined with modern works of art. The visible storage in the attics is a real favourite with many visitors too. The house staff are eager to help if you look a bit confused (the chateau is a bit of a labyrinth inside...) and happy to talk about the exhibits in French or English. And you don't have to stand in line to buy tickets any more. You can buy them online and print them at home. The online tickets are valid for 60 days. This minute vehicle is not a city car. 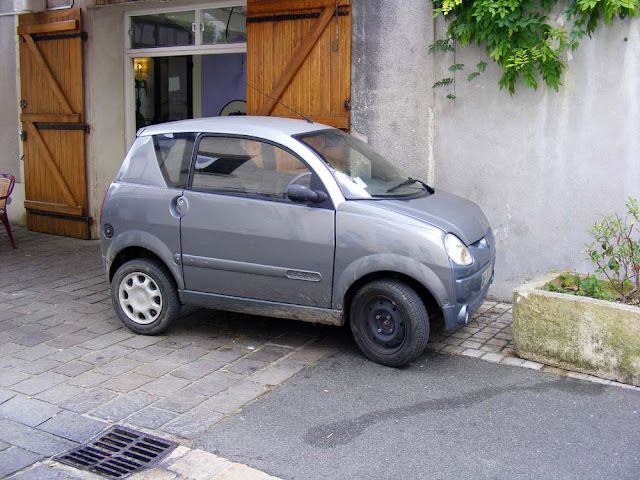 It is what is generally referred to in France as a sans permis (literal translation: 'without permit') or sometimes a voiturette (little car). This one is made by Aixam, the leading brand. The other main brand is Ligier. The expression sans permis derives from the fact that you do not need a permis de conduire (drivers licence) to drive one of these. 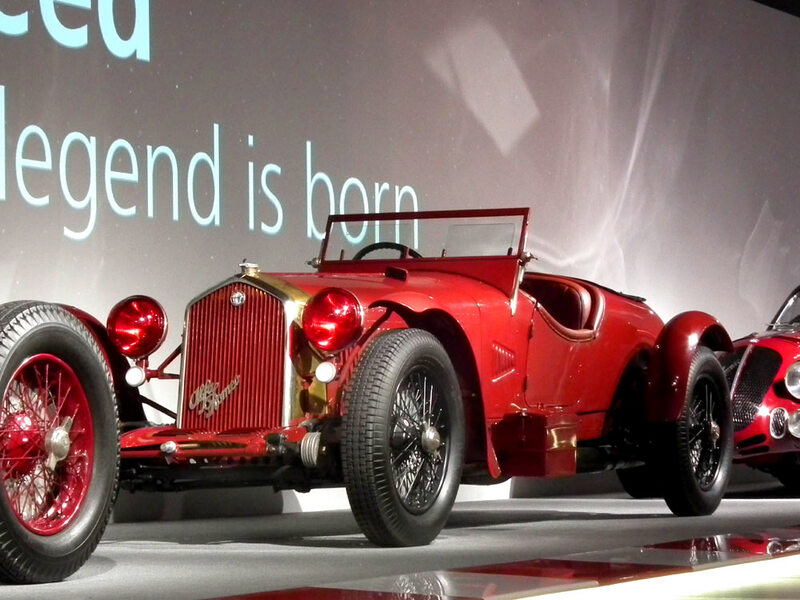 You can drive a vehicle like this on the public roads of France from the age of 14. 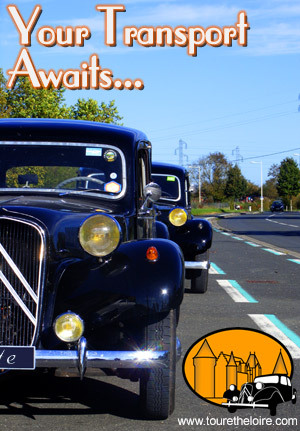 All you need to do is seven hours of practical training and if your driving instructor thinks you are safe, you will be issued with a permis AM (formerly called a brevet de sécurité routière or 'Road Safety Certificate'). The practical is broken down into two hours on the driver training course, four hours on public roads and one hour of practicing accident avoidance techniques (learning the relationship between speed and time taken to stop, anticipation, how to brake and corner safely...) There is no exam. The theory part is delivered as part of the curriculum at junior high. This permit allows you to drive a quadricycle léger (light quadbike), which is what this vehicle really is. They have two seats and a 50 cc petrol engine. Their speed is limited to 45 kilometres an hour. Drivers are not allowed to take them on autoroutes or divided roads that have more than one lane each way. The driver education programme is aimed at keeping adolescents safe on the road. The manufacturers of these voiturettes would dearly like to sell them to adolescents or the parents of adolescents, but the truth is they are so deeply uncool and so expensive that I have never seen an adolescent driving one. They all have scooters. The people who actually drive these vehicles are the aged who have never had a full licence, or those who have lost their full licences. Yes, that's right -- you can have your drivers licence removed but you can apply for a permis AM and be sent one automatically by the Prefecture. 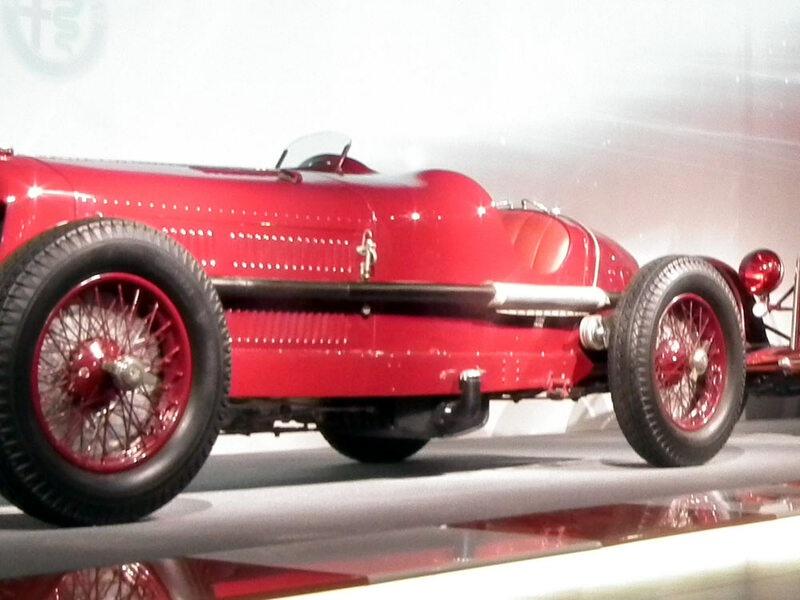 Mind you, the shame of driving around in a 50 cc vehicle limited to 45 kilometres per hour is probably seen as an added punishment, and you can't do nearly as much damage in a voiturette as you can in a BMW. This extraordinary portrait hangs in the Chateau of Blois. It's extraordinary on two counts. The first is the obviously unusual subject. 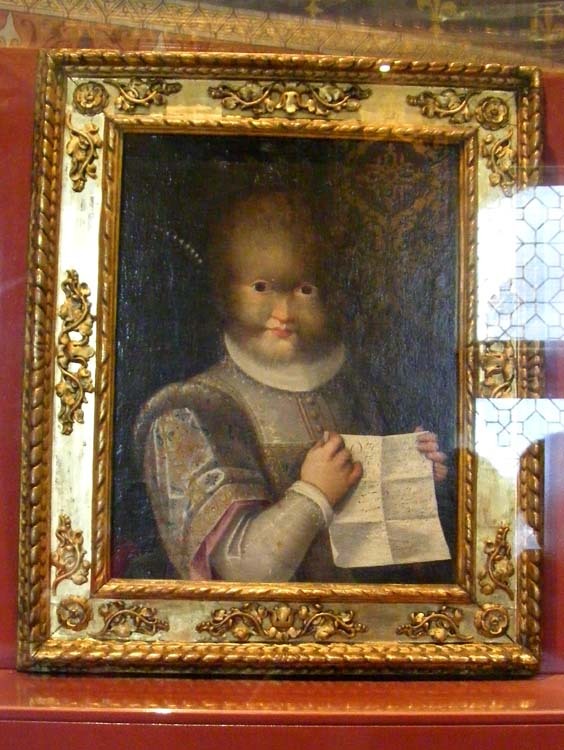 Her name is Antonietta Gonzales and she had a very rare inherited condition, called Ambras syndrome, werewolf syndrome (or hypertrichosis universalis). She was the youngest of three sisters and two brothers, all of whom had inherited their father's genetic disorder. It meant that they were covered in hair, much more than an ordinary person. The Gonzales family were great natural curiosities from the Renaissance period. Scientists of the time were intrigued. They were considered exotic wonders and were feted by several European courts. Surprisingly, their mother was a normal, rather attractive woman, and the family in many ways lived a normal life. The oldest of the girls married, and Antonietta may well have gone on to do so if she had not died young. Unlike what would have happened to them in the 19th century, they were not put on display as freaks. They were examined by several doctors who described them, but did not suggest any treatment. Instead Antonietta's father and brothers were given minor positions at court and the family might be thought of as similar to the dwarves that lived at court. They were favourites, sponsored and protected, servants but not prisonners. Their aristocratic patrons ensured that they were well dressed and well educated. Various drawings and portraits of members of the family were made and distributed as there was a burgeoning interest in the 16th century in scientific curiosities. The portrait dates from 1595 and the second extraordinary thing about it is that it is painted by a woman, Lavinia Fontana. The paper Antonietta is holding says that Pedro Gonzales was discovered on the Canary Islands and that she is his daughter. It says that Pedro was sent to Henri II of France and that she was subsequently sent to live in the household of the Marchesa Isabella Pallavicina of Soragna, in Parma. It seems likely that Lavinia met Antonietta as a little girl in Parma. Lavinia is the first female to become a professional independent painter. She is also the first woman to paint female nudes and supported a family of thirteen by her work. Born in Bologna, her father was also a painter. When she married (and had eleven children!) her husband looked after the family and acted as her studio assistant. The construction of this great organ is linked to the creation of the diocese of Blois in 1697 and was a gift from Louis XIV in 1702. 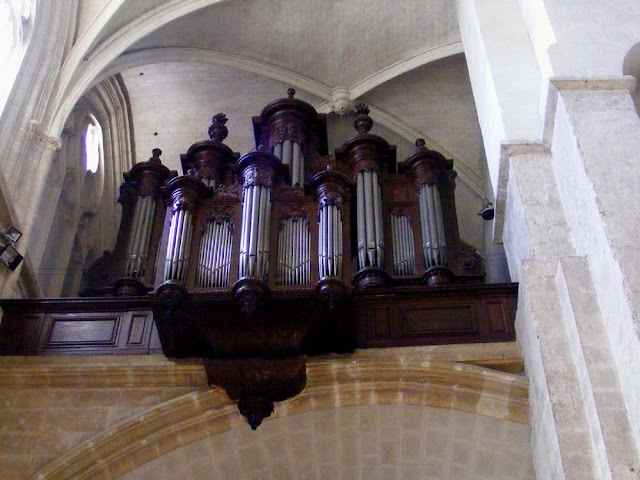 The project was allotted to instrument makers Robert and Jean Clicquot, who made the organ in the chapel at Versailles. In the 19th century the organ was rebuilt so it could play more modern music. In the mid-20th century some of that work has subsequently been reversed so the organ became neo-classical, and then at the beginning of the 21st century it was returned to its 19th century configuration. 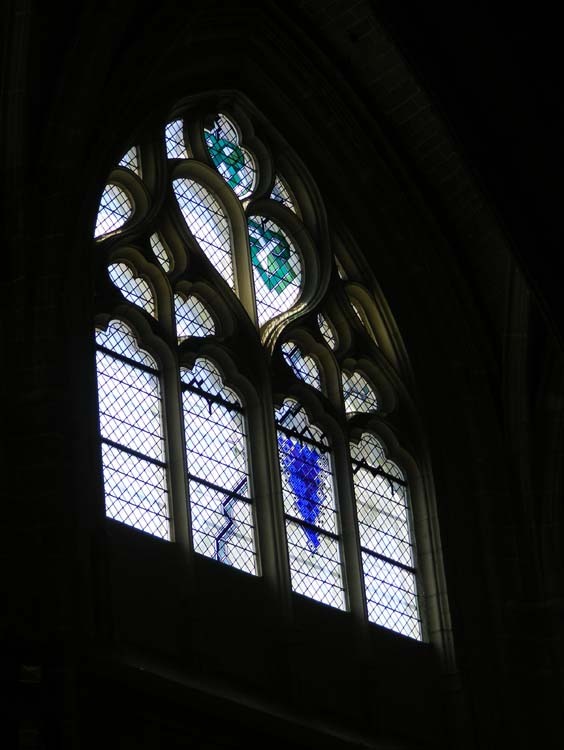 A lot of the stained glass in the cathedral was destroyed by bombing in the Second World War. Thirty-three windows had stained glass designed by Dutch artist Jan Dibbets and made by French artisan Jean Moret installed in 2000. They are deliberately very light, making use of much clear glass to take advantage of the light being reflected from the Loire river. 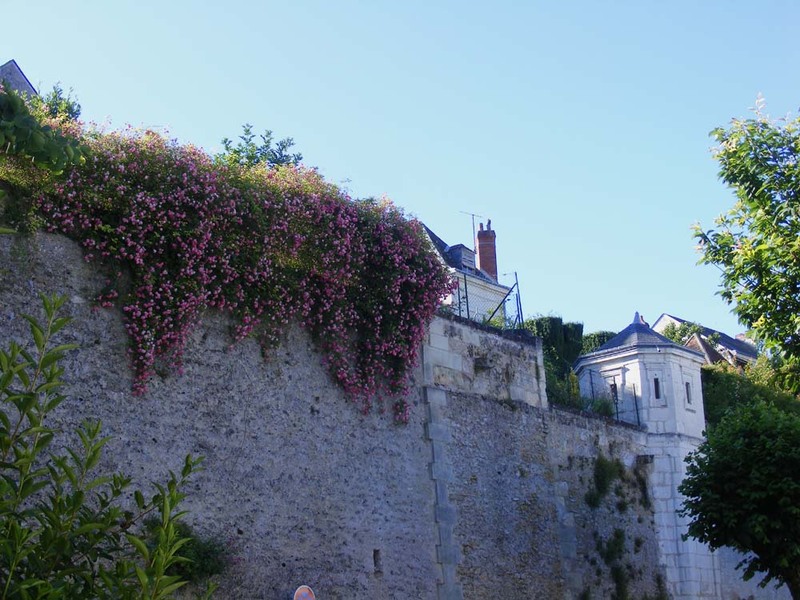 The one pictured above is high on the south side and represents the Vine, symbolising God's people and the body of Christ. 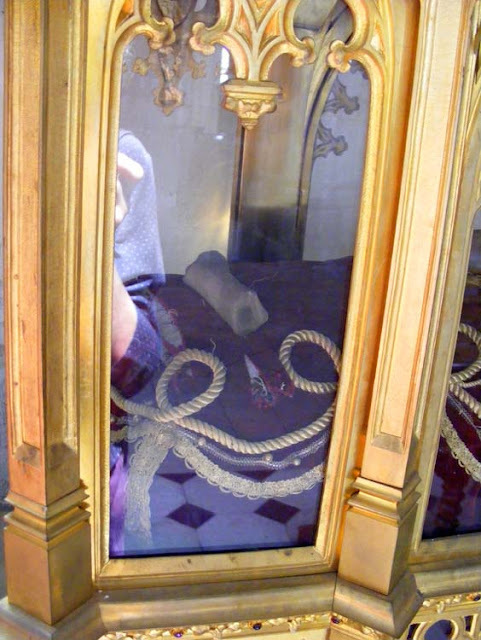 A relic of Charles of Blois. 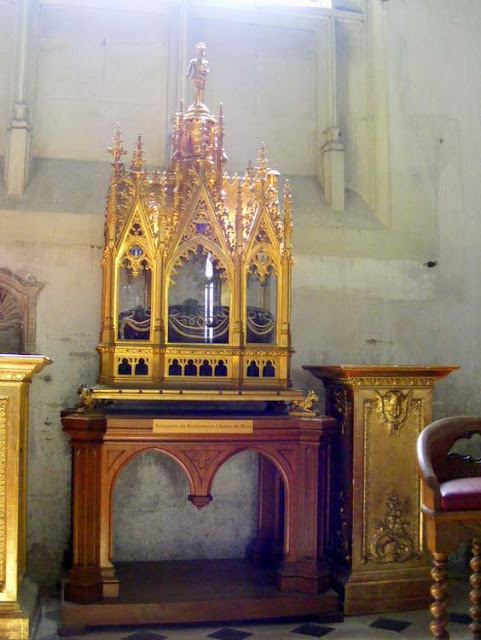 The reliquary of the Blessed Charles of Blois. Charles of Blois was Duke of Brittany in the first half of the 14th century, and inadvertently the trigger for the Hundred Years War. He was born in Blois, the nephew of the French king, Philippe VI, the first of the Valois line of kings. Charles was devout in the extreme, going in for all sorts of practices for mortifying the flesh (pebbles in shoes, knotted ropes tightly wounded around his body under his clothes, a hair shirt). He was also a much respected military leader. Because his claim to the duchy was through his wife, the neice of the previous duke, he had to fight for the title against the Montfort family, who claimed to have a better right to the title due to having a male heir, a half-brother of the previous duke. The French royal family backed Charles, the English royal family backed the Montforts. Finally, Charles was killed in battle and the Montforts won the title. Charles' piety was recognised by the Church and he was beatified. His pourpoint, an ornate tightly fitted padded tunic in white and gold brocade, survives and is kept in the Musée des tissus in Lyon. He would have worn his hair shirt underneath this garment. Rather surprisingly for such a grand object I can't find out anything about this altar. 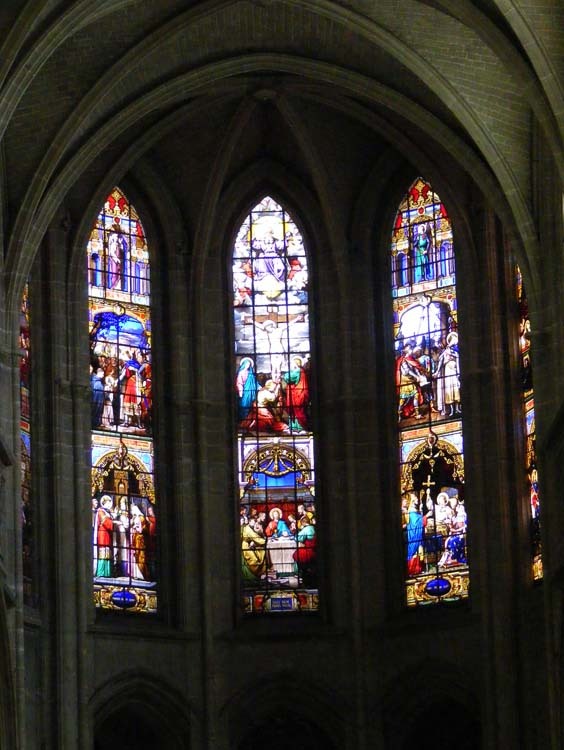 19th century stained glass windows in the chancel. 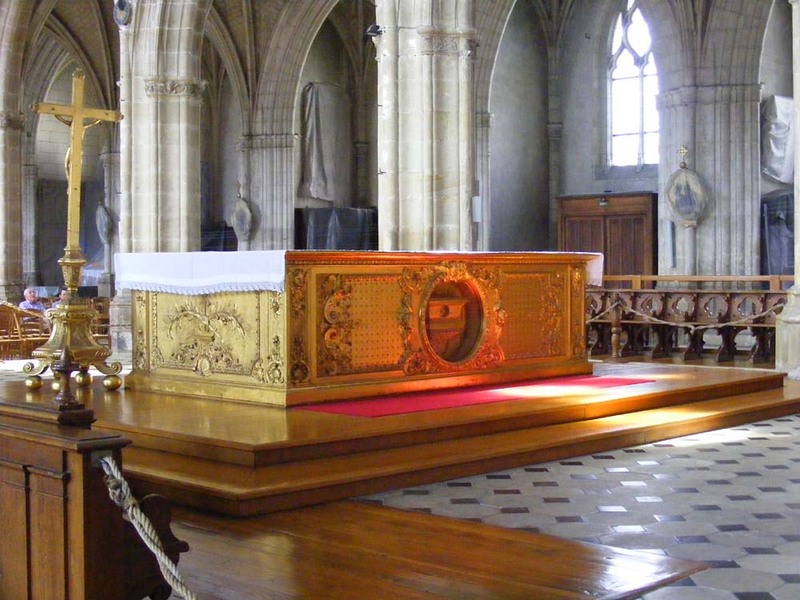 The chancel lancets are by the famous stained glass workshop of Lobin in Tours. This Peugeot RCZ* was spotted in Blois towing this ridiculously small trailer to the tip and photographed through our dirty windscreen. 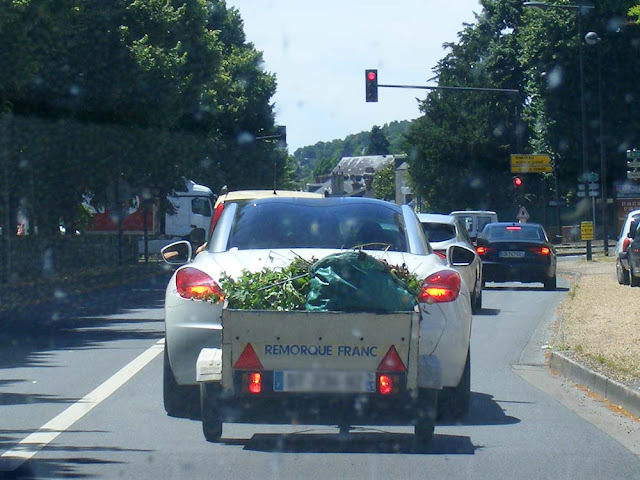 It struck me as a seriously uncool look, combining the Peugeot's 'double-bubble' concept car style rear windows and the absurd wheelbarrow sized trailer full of garden trash. 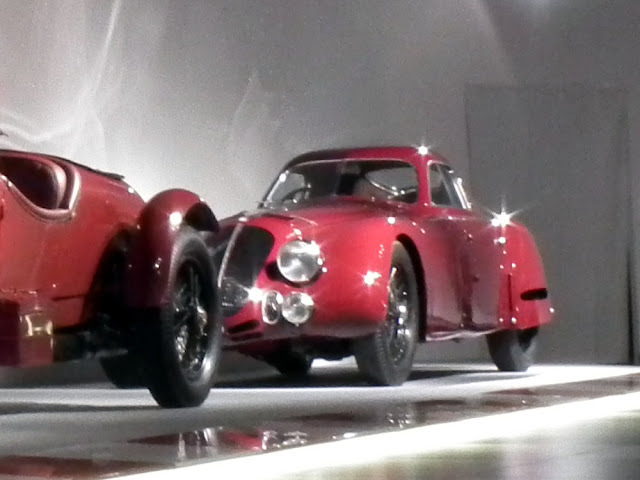 But perhaps I am being unkindly critical because it is a car I think looks pretentious without any redeeming elegance. *I assume that's what the car is. If it isn't I'm sure someone will tell me. Yesterday was toasty (about 36C) and today is expected to be warmer. It slopes off a bit after that, but not enough for us to be breaking out our woollies. 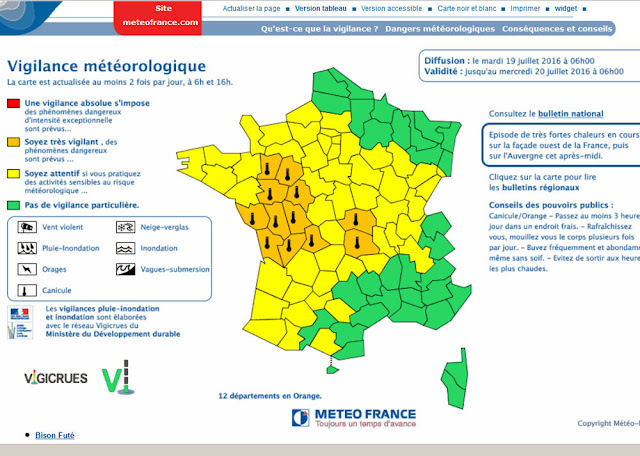 I always get a little thrill when we get a weather warning above yellow (yellow means "you might get some weather") and today we have orange. Yay. 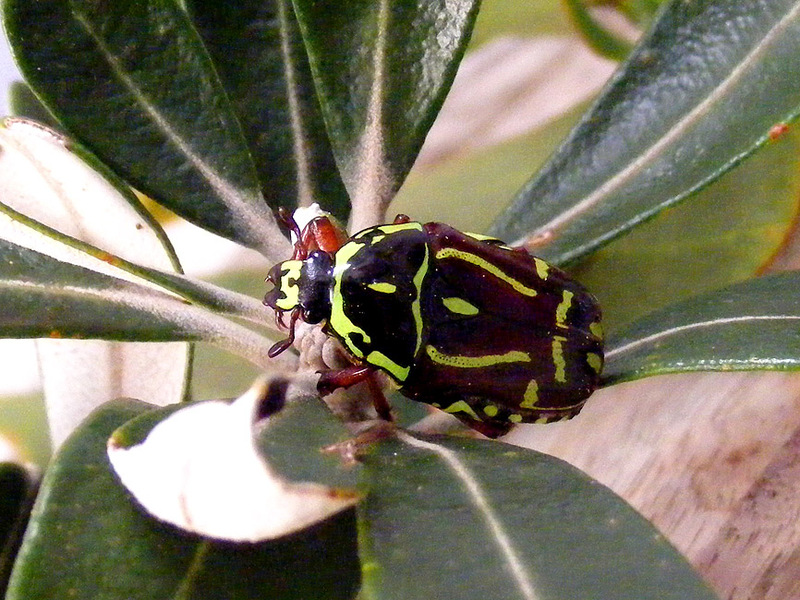 This large (2cm) and attractive Fiddler Beetle Eupoecila australasiae is not uncommon. They occur in eastern Australia and are named for the yellowy lime green pattern like a violin on their upper side. It is a member of the scarab family, in the flower chafer sub-family, Cetoniinae, so they are related to the metallic green Rose Chafers we get here in France. They fly strongly, seeking nectar rich flowers in heathland, eucalypt woodland and even gardens. On Sundays our posts have an Australian theme and you can read more of them here. I would have quite liked to go in here, but we didn't have time. 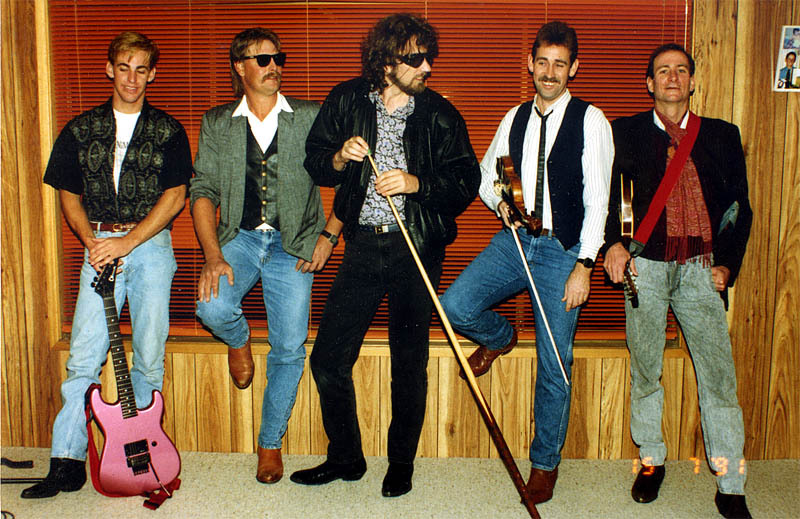 Twenty-five years ago (that's 25 years...) the photo below was taken. Matthew was a young bloke whose mother had convinced to respond to an advert looking for a guitarist to play in a bush band (Australian folk music, that is). 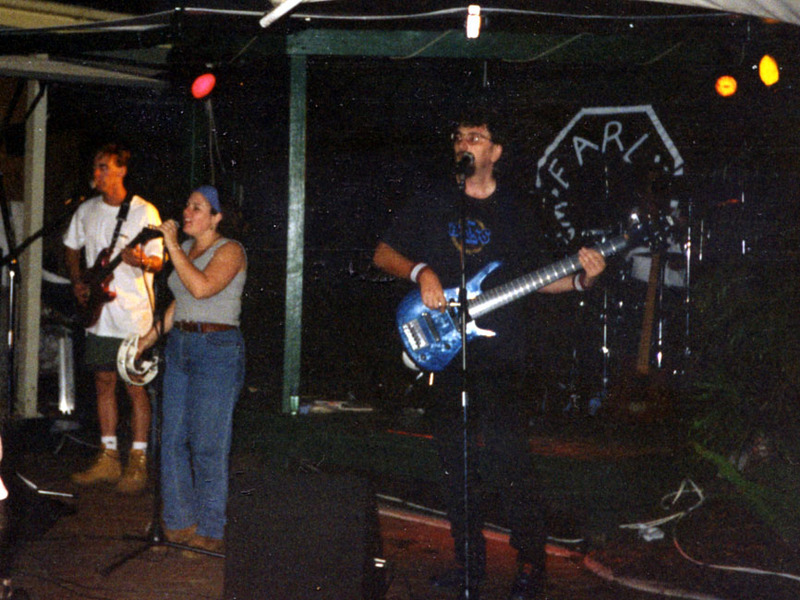 We then spent every weekend for almost 7 years travelling around south-east Queensland, playing clubs, pubs, and sports club awards ceremonies. We dont see each other as much these days, but 10 days ago Matthew and I made it into another photo together. It's good to catch up with mates. We had a great 4 days with Matt and his wife Nina (who is probably even cooler than Matt - I owe you that one mate...) and we both hope they will return soon. There are some more old photos of Matt and I in various bands. While Matt and Nina were here the fan belt in our Ford snapped. This left us at Chenonceau with no power steering, no air conditioning, and without the battery being charged. Luckily we were only 200 metres from a garage. To cut a long story short, we ended up with a new fan belt, and advice to have the alternator checked because it was making a noise. On Wednesday we made an appointment to see Cosson's (the alternator turns out to be OK), and I asked him to check the rear wheels, because Matt and I agreed it sounded like a wheel bearing was getting noisy. It wasn't a wheel bearing, but both rear tyres were worn on the inside, with the driver's side tyre having the additional bonus of being almost square where the steel belts had started to delaminate. Alexandre was most concerned that we shouldn't drive on tyres that were starting to let go so badly, and we were mortified that the day before we had been bombing along the Autoroute. Luckily, new tyres are on special this week, so we ordered two, and on Wednesday afternoon they were fitted. The car is now almost magically quiet, but this does mean that one has to look at the speedo more often: with almost no engine noise and no deafening rumble from the back it is very easy to creep past the speed limit. You don't catch me in a bird hide very often, but on this occasion I was with my sister and her husband, both keen birdwatchers, and we had been recommended this particular hide by a young French wildlife photographer we had encountered on an earlier walk in the Brenne. Whiskered Tern Chlidonias hybrida (Fr. Guifette moustac). 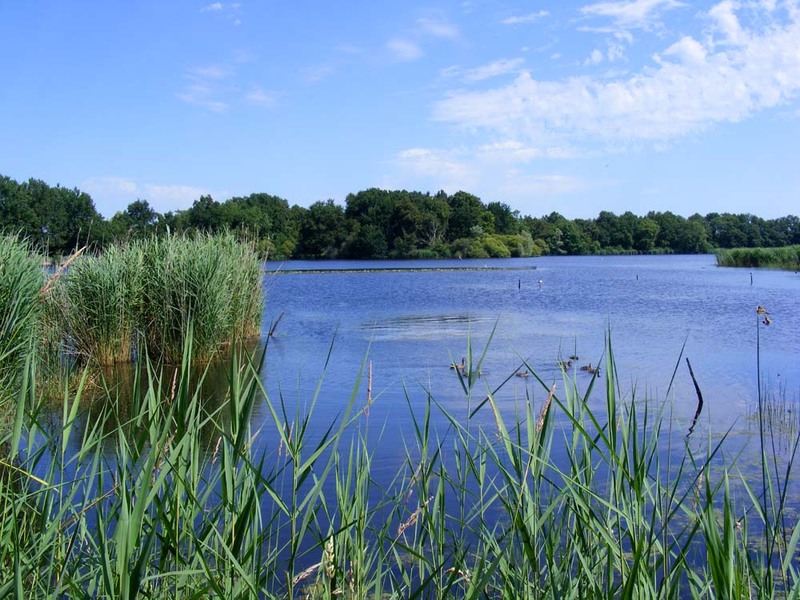 The League pour la Protection des Oiseaux (LPO) have set up a hide on the Étang de la Sous in the Brenne. 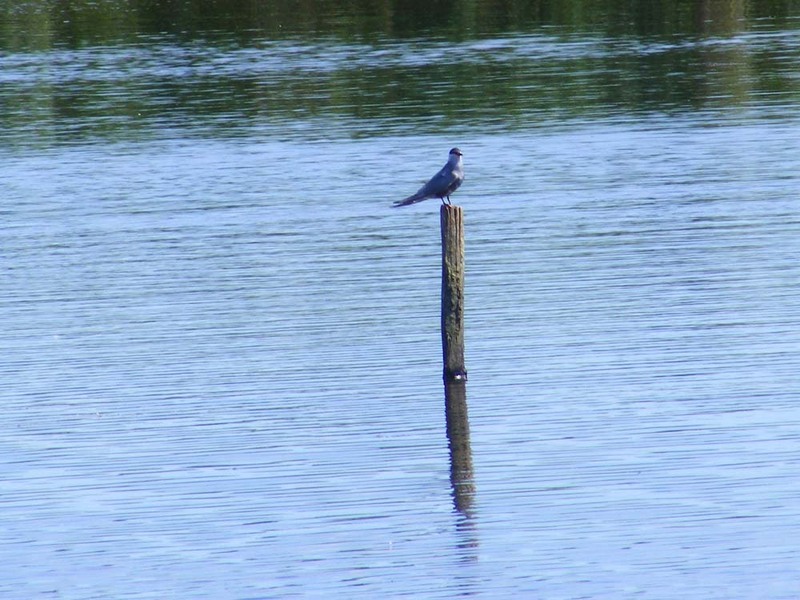 We were told that it is one of the best places to see Whiskered Terns and raptors. It turned out to be full of Dutch blokes with huge lenses and motor drives, but it's a big hide, so we didn't feel squeezed out. A Whiskered Tern collecting nesting material from the surface of the water (floating sticks and reeds). The Whiskered Terns have black heads and dark grey bodies which make their pure white cheeks really stand out. Their beaks are dark red and they have a deep notch in their tails. Success! and a dripping stick is borne away to the nesting colony. They are the largest of the 'marsh' terns (species in the same family as gulls, Laridae) as opposed to Sterna spp terns, which have their own family, Sternidae. In French the vernacular names reflect this split, with marsh terns known as guifettes and Sterna spp terns known as sternes. 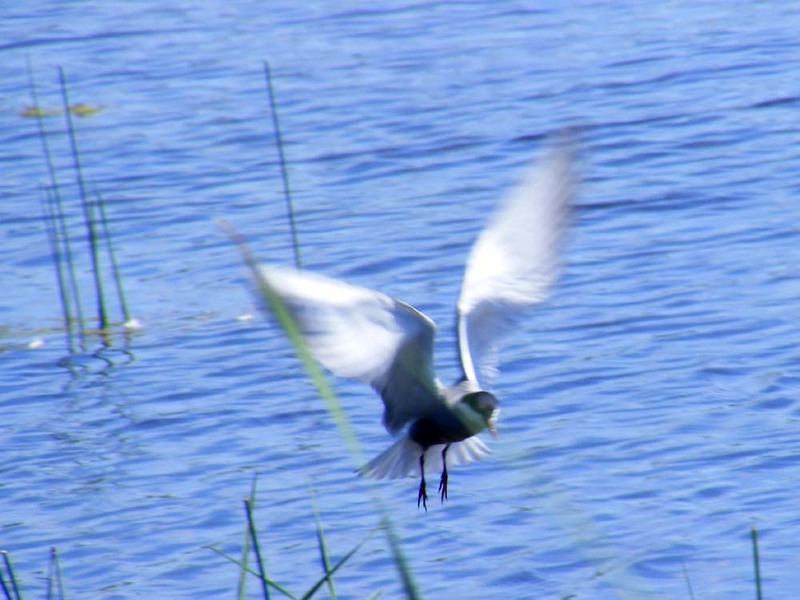 Whiskered Terns breed in freshwater marshes, fishponds and other ponds with emergent vegetation. View from the hide over the étang. 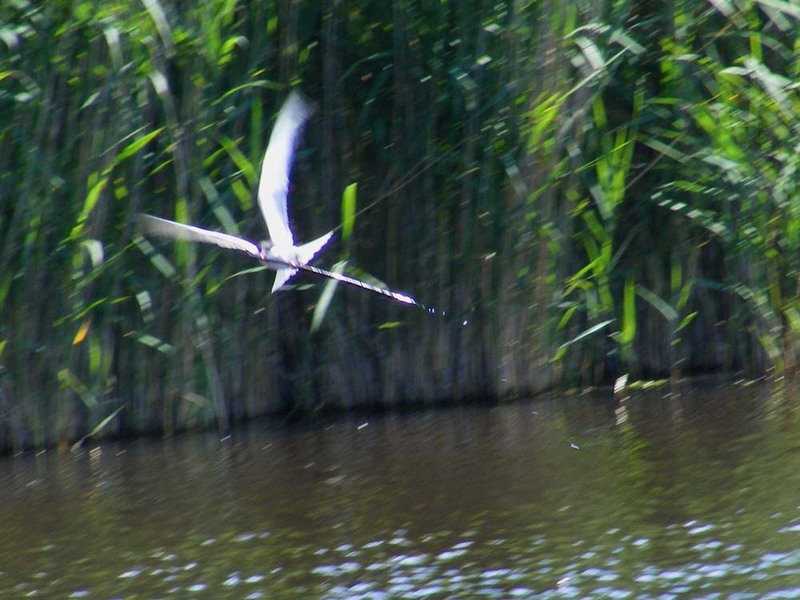 They are migratory, and come to the Brenne to breed in the summer. 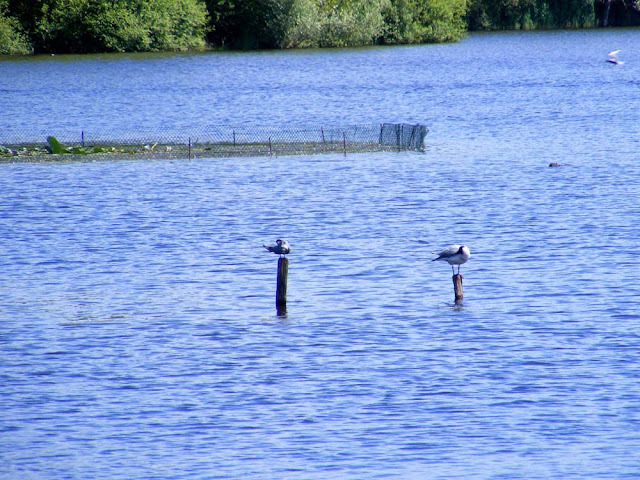 The Brenne is the second most important breeding area for the species in Europe. 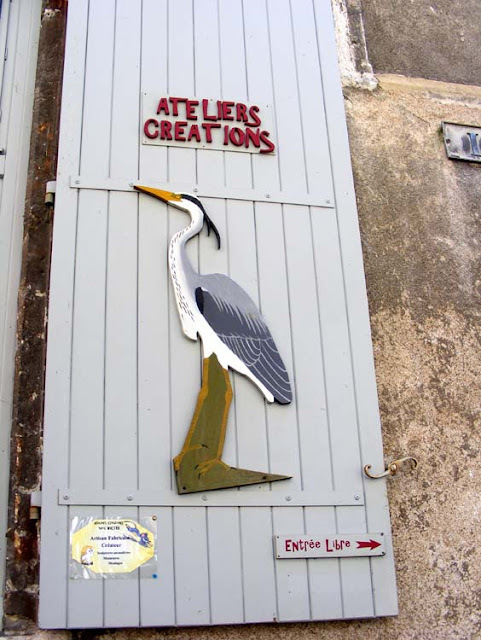 Like lots of our migratory birds in central France they overwinter in Africa. Once breeding has finished you can see them gathered together on the ground in large colonies. The next morning they will take off for their feeding grounds for the day. On the wing almost constantly, they hunt insects on the surface of the water. When they spot something to eat (a dragonfly, aquatic larvae or tadpole), they hover just above the water, then dart down and snap the insect up. They fly gracefully and rapidly. The nesting colony of Whiskered Terns. Widely distributed and not at risk globally, they are threatened in some areas by the usual suspects -- habitat destruction in the form of drainage of wetlands, canalisation of rivers, eutrophication of water (excessive nutrient levels in the water, usually agricultural runoff), disappearance of submerged vegetation and disturbance from tourism and aquatic sports. The fence protecting the colony. There is a Coypu on the right. The nest is constructed on semi floating vegetation, such as the water lilies shown in the photos. The nesting platform has been fenced off, I presume to protect the birds from some sort of disturbance. There is a Coypu cruising around in one of the photos and perhaps they could blunder through the colony and tip eggs or chicks into the drink. Coypus are vegetarian so I don't think they would steal the eggs or chicks to eat, and the terns seemed unbothered by the presence of one close to the colony. Mink would be a problem, but I don't think they occur here. 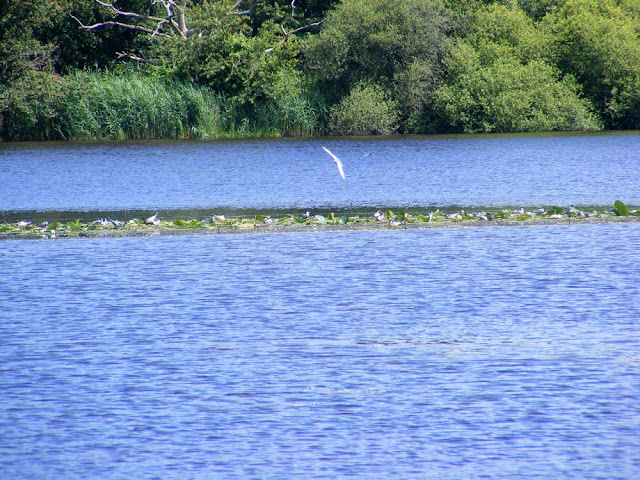 The birds often choose to nest in the company of Black-headed Gulls. These noisy and bolshy gulls apparently provide a level of protection for the terns. An artfully positioned dead tree serves as a perch for Black-headed Gulls. There are three sub-species of Whiskered Tern, one of which occurs in Australia, so I have probably seen this species before in fact. The Australasian sub-species is paler than the one we get in France apparently. The colonies in the Brenne are closely monitored and chicks are ringed every year. 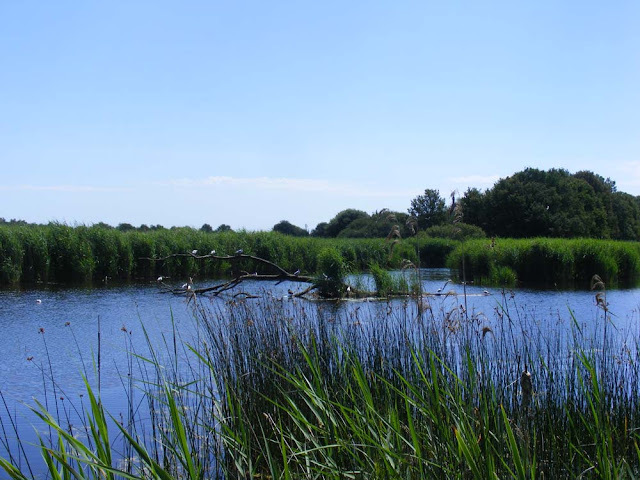 They are delightful birds and worth stopping off to see even if you are not a birdwatcher. I'm tired of reading about calls to emphatise (sic) with illiterate xenophobes whose position we must understand because they have been "left behind"... Tell it to their peers in Bratislava, Ljubljana, Riga, Warsaw or Zagreb. ... Perhaps Britain was once great. Yesterday it was just one European country out of many. But today it is even less than that. It's just a lonely little island with an inflated sense of importance. Take your 350 mil a week and choke on it. The above is an extract from a comment on a Guardian article the day after the referendum, by someone who calls themselves SardinesForDinner and is presumably Serbian. It immediately resonated with me, as does the Bosnian post. I wasn't always an EU citizen. I was once a Commonwealth citizen living in Britain. Luckily for me, when my original 4 year work visa expired, my boss offered to arrange and pay for fast tracked British citizenship for me. An Australian colleague was not so lucky and she decided that she no longer wanted to deal with the annual phaff, expense and inconvenience of applying for permission to live and work in Britain. After 10 years in the UK she returned to Australia. Brexit is a regular topic at the swimming pool where I go daily. Most French people are sympathetic to my views, but I have also been harangued by a complete stranger who couldn't see what the problem was. He felt his message was important enough to interrupt my conversation with an acquaintance (who is of North African descent). The arguments he trotted out sounded exactly like the Brexiteers (eg Britain has the Commonwealth...). His grasp of politics was such that he couldn't remember the name of the Chancellor of Germany though. I've been through the standard gamut of emotions after the referendum -- shock, disbelief, anger, resignation. Now I'm just irritated at the thought of all the paperwork that will come and the appalling waste of time and money it all is, just because a certain sector of the British public continues to see themselves as victims of the Thatcher years and wanted to give the Conservative government a kicking. Our property and business is in France. I'm an EU resident by choice. 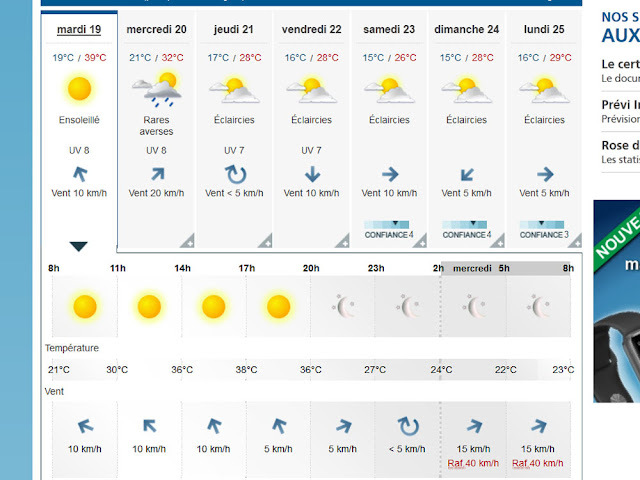 I won't ever go back to live in the UK (and will think seriously before I go back to visit in the future). The culture of envy and the conviction of many British that everyone else is richer and/or less deserving than they are that I first noticed when we moved to England nearly 20 years ago has become insupportable. Many of these people see themselves as the custodians of working class values but the reality is that their truculence and mindless anti-elitism traps them (and now everyone else) in a situation they are only too willing to be directed to blame on Europe.